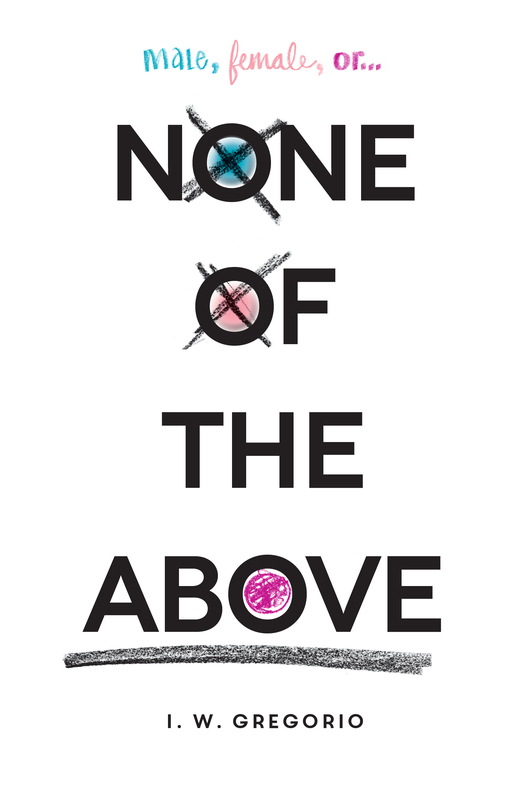 Today we are delighted to unveil the cover for None of the Above by I.W. Gregorio – out April 2015. Add None of the Above to your Goodreads shelf. 1) What were your first thoughts when you heard about the book? Did you have to look up what intersex was? Alison: I was thrilled to have NONE OF THE ABOVE land on my list. Of the many fantastic stories being written for YA readers, this book in particular will open our big and wonderfully diverse world to them. Jenna: Definitely! In high school, only 3 years of science were required, so I skipped Biology in favor of art… this was a real eye opener for me in terms of genetic possibilities. 2) Can you tell us about alternate design schemes that you decided not to pursue? Alison & Jenna: We looked at many jacket designs, each playing with different aspects of Kristin’s life and not all of our designs focused strictly on her being intersex. We wanted to make sure it didn’t feel too medical, like a textbook, or venture into “colder” territory since the voice is so accessible. 3) What was the biggest challenge when making the cover? Alison & Jenna: Our goal, of course, was to design a cover that was eye-catching and respectful of the intersex community. We had an amazing title that really guided us. And we ended up with our final image, which is a combination of a standard form and color assignments as they relate to gender. 4) What do you love the most about the cover? Alison & Jenna: We are keen on the lovely hand-lettering Jenna created for the jacket, it really softens up the boldness of the display type. The idea of filling the letter “O”‘s as if they were the circles you are meant to fill in on a standard form with gender-typical colors pink and blue and then crossing them out adds a bit of emotion to the cover. And of course the scribbled in purple “O” of ABOVE really adds a hit of confidence that we know Kristin has at the end of the book. I think Alison and Jenna did a brilliant job of creating this jacket. This is a groundbreaking story of an intersex character-but it’s about so much more than a medical diagnosis. This is really a book for any reader who loves strong, inspiring characters and meaty relationships. The reader is so completely in Krissy’s story as she’s going through these incredible personal challenges. So when we were discussing this jacket, we wanted a concept that went beyond the traditional gender symbols, but also gave a nod to that in a fresh way. I love how this jacket helps illustrate the title. It’s so clean and graphic too-it should really stand out on a shelf! I. W. Gregorio is a practicing surgeon by day, masked avenging YA writer by night. After getting her MD at Yale, she did her residency at Stanford, where she met the intersex patient who inspired None of the Above, her debut novel. 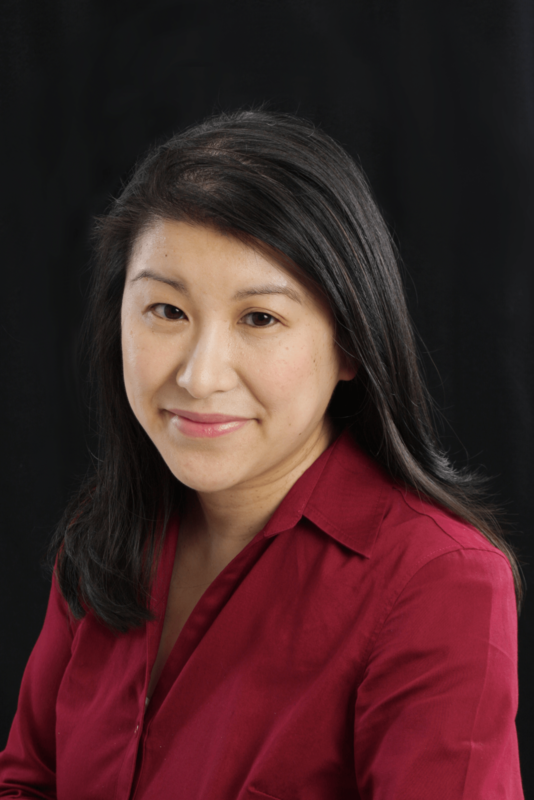 Her essays and nonfiction writing have been published in the Washington Post, San Francisco Chronicle, San Jose Mercury News, and Journal of General Internal Medicine. A founding member of We Need Diverse Books™, she serves as its VP of Development. She is a recovering ice hockey player and lives in Pennsylvania with her husband and two children. Follow her on Twitter at @iwgregorio. Thanks to the publisher, we have two advance reading copies of None of the Above up for grabs! The sweepstakes is open to addresses in the United States only, and will run until Saturday, October 17 at 12:01am EST. To enter, use the form below! Good luck! Thanks so much for sharing! This sounds like such a fabulous story, and I really can’t wait to read it! The cover is simple but beautiful, and it is so interesting to read about the small details/nuances that the designers embedded into the cover—they did a wonderful job of conveying meaning and emotion. The book sounds wonderful and I love the cover to bits!